A former member of Committee on Dialogue and Peaceful Resolution of Security Challenges in the North, Barr. Aisha Alkali Wakil (a.ka. 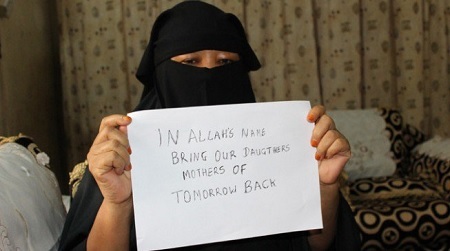 Mama Boko Haram) on Tuesday asked the Abu Musab Al-Barnawi-led faction of Boko Haram to release the 110 girls abducted from the Government Girls’ Science Technical College, Dapchi. Wakil’s appeal followed fresh lead that the Al-Barnawi faction had been operating along Yobe State axis and might have abducted the girls. Al-Barnawi (named Habib at birth) was said to be the son of the late founder of Jamā’at Ahl as-Sunnah lid-Da’wah wa’l-Jihād (now known as Boko Haram), Mohammed Yusuf, who was killed in police custody on July 30, 2009. Following irreconcilable differences on Boko Haram’s modus operandi, Al-Barnawi parted ways with the sect. But Wakil, a North-East human rights activist with strong links with Boko Haram, spoke with PRNigeria in Maiduguri, Borno State, and urged Al-Barnawi to spare the girls. According to PRNigeria, the activist who cried profoundly said: “This thing that is happening, is really breaking my heart. These children don’t even know what they are doing. Some of them were not even born at the time this thing started. “Wallahi I will go after them, even if it will take my life to save these girls. They call me Mummy, but they don’t listen to me. “I heard you are now being called ‘Abu Mussad Al-Barnawi’ but I know you as Habib and I am begging you to stop the killing and abduction. “I have sent many messages to you. I don’t know if you are getting these messages or you just chose to continue to hurt your mother and make her cry. “Dear Habib, Nuru and others, I was told you may be the ones responsible for the kidnap of these girls. Where ever you may be if you are listening to me, I beg you in the name of Allah to release the girls back to their families. She pleaded with Al-Barnawi to come out and lay down his arms alongside his members. She added: “Please come out. I will never deny you even if the whole world did. Those who know you know your heart. They know you are no longer interested in the fight anymore. “Disturbed about the latest abduction of 110 students of Government Girls Technical College Dapchi, Aisha has renewed her commitment to help end the Boko Haram insurgency. “Respected by many in her community, Wakil has been actively involved in efforts to end Boko Haram through her NGO “Complete Care and Aid Foundation” aimed at restoring peace to the North East by rehabilitating the youth against warped ideologies that mislead them to join the terror group.